The Netherlands’ state-owned railway company claims to be the first in the world to run its trains entirely on wind power. NS, working with electricity company Eneco, revealed that it has made the transition a full 12 months sooner than initially planned. The company handles around 600,000 passengers per day, with 5,500 train trips per day, meaning that on average each train trip transports just over 100 people. One windmill, operating for around an hour, can produce enough energy to power a train for 120 miles. It’s a boost for reducing carbon emissions, but the Netherlands model may not be copied so easily. NS stated that an increased number of wind farms around the country allowed the company to achieve its goals faster. NS spokesperson Toby Ellison said in a report published Wednesday that Eneco’s wind farms aim to satisfy demand, but it’s also struck contracts in case the output dips below the estimated 1.4 terawatt-hours needed in one year. A country that’s historically been quite fond of windmills, the Netherlands is ideal for Eneco’s plans in a way other countries may be less receptive to. There are other options for powering trains elsewhere, though. In May 2016, India started a solar-powered train trial, placing the panels on the roof. Each coach is capable of producing 3.6 kilowatts of power. 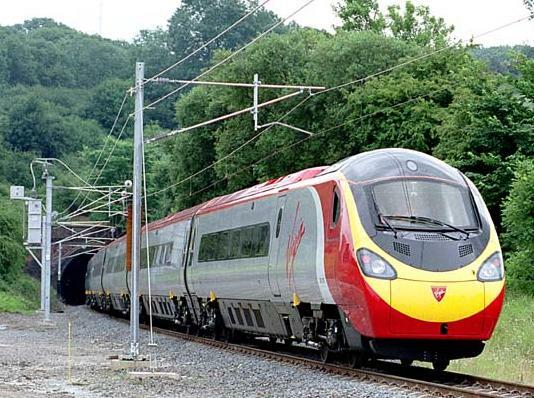 A train traveling from London to Glasgow: could solar panels one day power the journey? Others have considered placing the panels alongside the tracks. On Monday, Imperial College London announced a new project to explore track-side solar panels for powering trains, which would significantly decarbonize the U.K.’s rail network by the year 2050. The plan is unique as it would bypass the grid altogether, powering the train directly.